McDonald's can be found in an ideal location at 50-52 Foregate Street, approximately a 0.33 mile distance south-east from the centre of Chester (by Frodsham Street). This restaurant is a handy addition to the areas of Northgate Village, Hough Green, Chester City Centre, Handbridge, Boughton Heath, Newton, Newtown and Caldy Valley. Its business times are from 5:00 am until 11:00 pm today (Friday). This page will provide you with all the information you need about McDonald's Chester, Foregate Street, including the working hours, restaurant location, direct contact number and additional details. McDonald's can be found not far from the crossroads of Foregate Street and Love Street, in Chester, Cheshire. Simply a 1 minute trip from Vicar's Lane, Forest Street, Priory Place and Union Street; a 4 minute drive from St. Oswalds Way, Little St John Street and Pepper Street; and a 11 minute trip from Grosvenor Road or St Oswalds Way. Please enter the following postcode when using Satellite Navigation systems (GPS) to find this restaurant: CH1 1HA. Customers can take a bus to Argos, Foregate Street, Frodsham Street and Visitor's Centre. Trains operate to Chester Station (2570 ft) and Bache Station (1.27 mi away). The Merseyrail and Arriva Trains Wales lines stop a short distance away. Within a couple miles you can come across The Roodee Sports Centre, The Queen's School (Senior School), Saint Werburghs Church, Grosvenor Park, Water Tower Gardens and Queens Park High School. 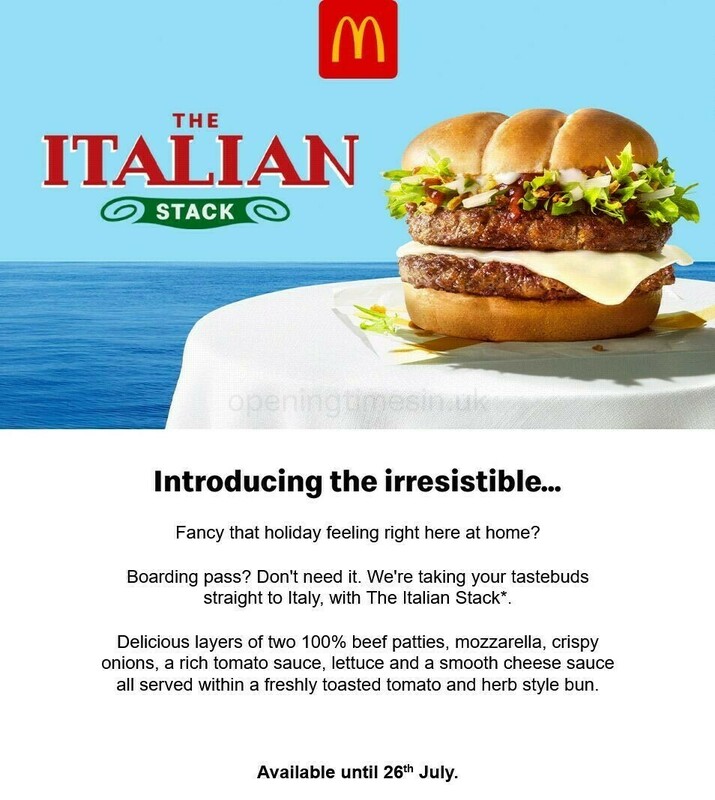 With this restaurant, McDonald's now has 5 different branches in Chester, Cheshire. Go to this page for all McDonald's restaurants near Chester. Please note: UK national holidays may cause revisions to the usual opening times for McDonald's in Chester, Foregate Street. For year 2019 it applies to Christmas, New Year's Day, Good Friday or Early May Bank Holiday. For more info about the seasonal operating hours for McDonald's Chester, Foregate Street, go to the official homepage or phone the customer service number at 370 524 4622. Help our team keep the information as up to date as possible. Please don’t hesitate to make use of the report a problem form to report any mistakes with the location description or restaurant hours for McDonald's in Chester, Foregate Street. Support potential patrons with your feedback! In the space provided below please express your thoughts about McDonald's and rate the location using the star system.